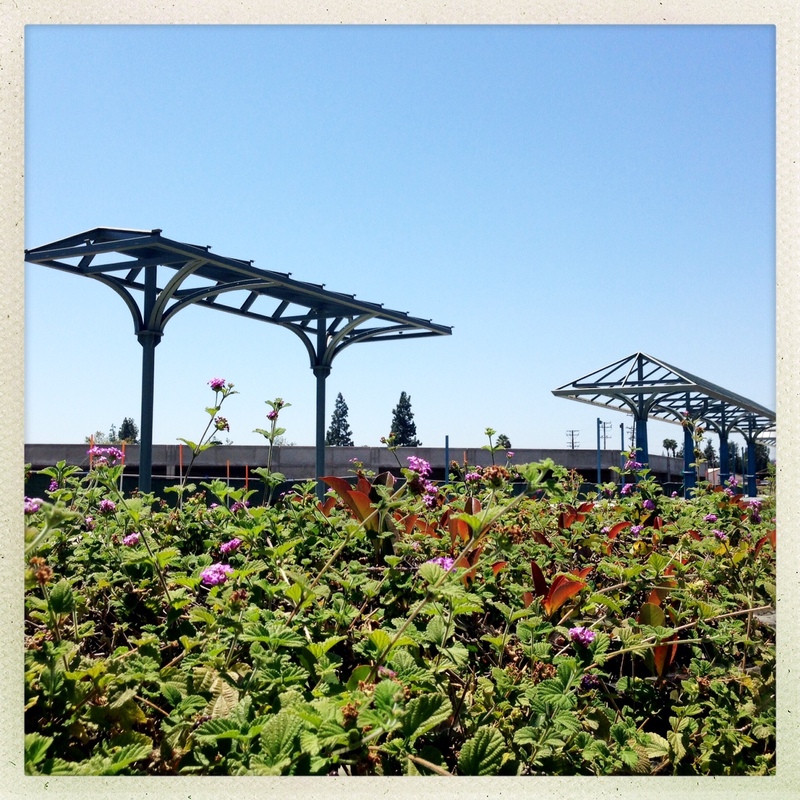 ART OF TRANSIT: The new platform for the Arcadia station along the Gold Line Foothill Extension. Photo by Steve Hymon/Metro. This is one of the smartest posts I’ve read in a while about the challenges facing transit in big cities in the U.S. The article is based on maps produced by MIT that allow for comparisons in travel time in a variety of cities (unfortunately, there’s no map for L.A. yet). The gist of it: cycling and driving in many cities are a more efficient and faster way of getting around than transit. Another takeaway is that these maps illustrate why people make rational calculations to drive so much of the time, even in cities where decent transit does exist. The total financial cost per trip of driving somewhere is likely higher than taking transit (or biking), once you factor in car payments, insurance, and maintenance. But we tend to treat those as sunk costs. And so we often make travel decisions with a time budget in mind, not a financial one. By that metric, it’s clear here why people who can afford to drive often chose to. It’s also clear on these maps that people who can’t afford a car pay a steep penalty in time to get around. Transit advocates spend a lot of time worrying about the lack of appeal of transit for “choice riders,” or commuters who have other options for getting around. It’s important to recognize that the decisions they make are often weighed in time. That means that a big part of the challenge here for cities is to make transit a more efficient travel mode, relative to cars, for more people…. But outside of New York — with its extensive subway system — this is an extremely difficult task, particularly given that most of these maps reflect the fact that we’ve built cities to be traveled by cars (by, for instance, routing highways through them). But it’s possible to increase the relative efficiency of transit by creating dedicated lanes and signal priority for buses at stoplights, or increasing forms of express transit service. Transit networks could even compress what feels like the time cost of riding transit by adding cell service and WiFi that enable passengers to use time spent commuting productively — and in ways that aren’t possible from the driver’s seat of a car. I hope every transit advocate, planner and elected official in our area reads this. I realize some people may not agree, but it certainly struck a chord with me and articulated what I’ve been trying to say for quite a few years: many commuters — including nearly all that I know — consider time the biggest factor in their commutes. They like the idea of transit, but time usually trumps things such as “liking the idea,” cost and the do-gooder factor. •This article indirectly implies that slowing down transit with extra traffic signals is a great way to dampen ridership and the investment made in transit in the first place. •The MIT maps are a great argument for a healthy expansion of cycling infrastructure. As Emily writes, there probably is a cap on the number of people who will commute by bike, but there’s probably reason to believe most cities can grow the number of bike commuters somewhat. Well, that’s certainly an eye-grabbing headline given that Bill Ford happens to be the Big Cheese at one of the world’s largest automakers. Unfortunately the op-ed is behind the WSJ pay wall. If you read it, please leave a comment summarizing the article. Thanks! Photos and text look at some of the development plans in Monrovia, Duarte and Azusa adjacent to the project that is extending the Gold Line from eastern Pasadena to the Azusa/Glendora border. Looks like Monrovia is the most ambitious thus far with its Station Square plans; I think there are some great opportunities up and down the 11.5-mile alignment. Or to put it in one sentence: the federal gas tax hasn’t been raised in 21 years, cars are more fuel efficient, people aren’t buying as much gas, people are driving less. Why does it matter? The Highway Trust Fund helps pay for road work and transit projects across the country and agencies such as Metro rely on those dollars. More on that later today. Emily Badger totally hit the nail on the head – time is the big difference between transit and other modes. But I think both you and her miss perhaps an even more crucial component of time; namely, time to begin your journey. The real freedom that a car or a bicycle or walking provides is the ability to begin your trip at whatever moment you choose. But with transit you’re often forced to wait for the vehicle to arrive. There is a study I am trying to track down that showed people cared more about the wait time – i.e. to begin their journeys – than travel time. Not that the latter is to be ignored, but that once you get passengers moving, the greatest source of frustration has been removed. And what this leads to is the huge importance of good headways. Achieving real “turn-up-and-go” service MUST be the goal of any transit system, especially if it is to attract real “choice” riders (and to eliminate the need for captive riders to want to add that car in the first place). Running as many vehicles per hour as possible – and then some – is the best way to allow transit riders the same freedom and time savings as all other modes. And re: the WSJ piece on rethinking cars, if you just copy and paste the article title into a google search and click the link, it should get you past the paywall. I didn’t find much new in it. There are other reasons why Americans choose the car over public transit, not just for time reasons. The car signifies the core of American ideals: freedom and independence. The car has no set time hours or schedule so if you want to leave your home at 3 AM in the morning, it can do that. The ability of the car to go wherever you want, whenever you want, is a perfect example of American freedom. The car has no preset conditions or rules of riding. You can eat anything, drink anything, and listen to the radio or music at any volume you want. It’s your own car, you can do whatever you want to do inside it and no one (other than someone else riding the car with you) will be bothered by it. The car is generally comfortable and safe. The space inside the car is all yours and you don’t have to share the ride with someone you don’t know. It’s never cramped with other people, there are no crazies, panhandlers, or thieves to worry about when driving inside the car. The car offers freedom when nature calls. You want to go to the restroom, you can just pull over to the nearest service station and borrow a restroom. When you gotta go, you gotta go. The car offers lots of storage space. You can go to Costco and buy a whole months worth of groceries and pack them into the trunk. Being able to cart around many things, typical of American consumerism, fits well with car ownership. All of these are freedoms that Americans enjoy with the car and even if car driving is getting expensive, they still would rather opt to pay for the ability to have such freedoms than taking public transit. I’ve found that the Google bicycle times are great for someone who might be a daily commuter, going at a fast clip with no baggage, but unsustainable for someone who might have to go longer distances. I agree that in most instances, when you are putting a bike on a bus and the bike rack is full, you are more likely to get there faster riding yourself if the bus runs every half hour or less. One of the issues with the “transit” time is that much of the time is not spent moving but waiting for transfers or vehicles, especially in lower density areas and low frequency routes. Bikes and cars are personal transportation and you can leave without a schedule. Other than getting sweaty biking during the summer, the other big issue is bike security. We know bikes are stolen from in front of businesses and from rail stations all the time. We need cameras on bike racks that are web accessible and archivable so that people have that warm fuzzy feeling the bike will be there. We also need ways to make bike parking easier, like day use lockers in places where people are going to leave their bikes for more than a couple of hours. No one wants to walk miles home because their bike got stolen. The WSJ article is essentially more automaker propaganda. It simply talks about the need to update marketing of cars and the need to better integrate them into the overall transportation system. In addition, it denies the inevitability that our current infrastructure cannot accommodate more new cars on the road in future generations. It mentions but ignores the effect that rideshare apps such as Uber, Lyft, and Zipcar are having on individual car ownership and necessity, the article seems to indicate that car manufacturers remain blissfully ignorant to their effect. It’s a great article if you want to hear about how the auto industry should update themselves to keep selling and stay relevant in the wake of growing competition in the form of alternative transportation and investment in public transportation. The automobile manufacturers have been selling the automobile as “freedom” for many years, and they’ve gotten very good at it. But is it really freedom, or is it just another kind of slavery? Instead of being enslaved to a transit schedule, you’re enslaved to the work, and the stress, of keeping a couple of tons of self-propelled tin under control — a job that other people get paid to do — all while paying for the privilege, paying the ever increasing cost of fuel, parking, and maintenance for that hunk of tin, and strapped into your seat, with no opportunity to stretch your legs unless you pull over and get out. Meanwhile, most of my trips into Los Angeles, I’m riding in the relative comfort of a modern trolley car, free to read, nap, or at the scenery. And when visiting cities like San Francisco, Boston, Philadelphia, and New York, that had never gotten rid of their urban rail, there’s even less need to get behind the wheel. I think slavery is not quite the correct word, but I understand what you’re saying. I think it’s a many-shades-of-gray kind of thing. I happen to like my car. I also didn’t overspend on it and I try to keep my cars for a very long time. One way I do that is by using transit and riding my bike when possible. I do think others over-spend on cars and then they get in trouble and it becomes a bigger burden than it’s worth (literally!). What about the future of public transit? Google driverless car technology is just around the corner. As soon as this hits the market, no one would need cars or even need to rely on public transit anymore. Just fire up an app on your smartphone, a car shows up and takes you where ever you want to go. Just like how the internet killed off the newspaper industry, Google driverless cars would end up killing off the automakers, taxi, the public transit industry and the transportation union all at once. True driverless technology is not around the corner. First you’ll have glorified cruise control and then maybe self parking. Cars where you don’t have to be in the driver’s seat are decades away. Yeah, like public transit is any better. You’re a slave to operating hours of the public transit system. You’re a slave to conditions that you cannot control like transit strikes and maintenance delays. You’re a slave to the number of people and who’s using it at any given moment. You can’t choose who to share the bus and train with which can include drug dealers, gangsters, pedophiles, lechers, gropers, mass murderers, illegal vendors, and other wackos. The public remains a hostage to lazy union members who demand $30 an hour wages for driving a bus, a skill that a computer could do in the next five years thanks to advancement in driverless technology. The public remains hostage to overpaid government bureaucrats who haven’t have the slightest clue how to run a transit agency. The public remains a slave to constant fare increases and service cuts whenever budget problems arise. There are pros and cons to car drivings just as there are pro and cons to using public transit. And so far, the cons of using public transit outweigh the cons of car driving and car ownership, so that’s what a vast majority Americans choose to use to get around. And realistically, much of America is rural open space. If you idealistically believe that world class trolley systems is going to magically appear in places like Toledo, OK or Bismarck, ND or Macon, GA or Modesto, CA where people living in these places won’t need a car anymore to get around, I’d like to know what you’re smoking. Regarding the Post story: people drive because we, as a society, basically pay them to drive. For the past 50+years our collective investment in driving (roads, highways, parking, wars for oil, etc.) has dwarfed our investment in walking, bicycling, and transit – orders of magnitude more has gone to cars, so, yes, they’re going to get many people to many destinations more quickly than other under-invested modes. We bet the farm on driving as the only solution, and even as much as we’ve propped it up, the system still fails to deliver mobility and convenience (not to mention safety, health, sustainability) twice daily when it is most in demand. And despite this investment, it seems like most drivers hate their commutes. Time to diversify our investments. In the past I was in your shoes. It seemed unrealistic that Google claimed that driverless cars are less than five years away. I scoffed at that idea that it was at least 20 years away. But the way technology is moving so fast these days, far faster than people can keep up, looking at driverless car Youtube videos by Google, the capabilities of what Google can do with their Google Maps, GPS technology, how powerful computers have become that a modern day smartphone that fits in your pocket is more powerful than all the NASA computers used to put a man on the Moon, and the testing going on with driverless cars around Silicon Valley, even I am beginning to believe that driverless cars will be on the market before this decade is out. It really seems like something out of a science fiction movie, but really, who’d imagine we’d be living in a world of globalized telecommunication, online access everywhere, smartphones, and tablet devices of today with Google Glass already in mass testing phase through the Explorer program? The only thing that hasn’t changed since the Model T came out in 1908 was the fact that it requires a human being to be at the wheel to go somewhere. It’s has been over 100 years since the first Model T rolled off the Ford production line in Detroit, it very might well be the next big thing in 2018 is when Google rolls off driverless cars to the public out of Silicon Valley. Bill Gates once said “if General Motors had kept up with technology like the computer industry has, we would all be driving $25 cars that got 1,000 miles per gallon.” He actually maybe right; we’re probably on the verge of seeing that coming to fruition with Google driverless cars. For me, the freedom I experience traveling without a car is qualitatively superior to the freedom I experience when traveling in one. @Low Headways hit the nail on the head. The one thing that stands out about Metro is the huge drop of bus headways between peak and off peak hours. No other large city has such poor evening and weekend service on primary routes. Metro needs to designate a “Frequent Service Network,” probably the 25 core routes that have “Owl” service and run them at least every 15 min. at all times.